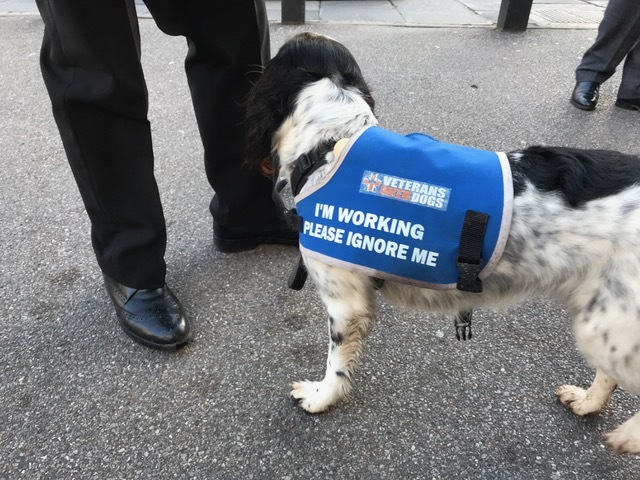 Service and therapy dogs have been providing vital help and support to those suffering from PTSD, helping them lead more independent and fuller lives and enjoy better mental health. Using service dogs to help those struggling with PTSD is a relatively new initiative. The Veterans With Dogs assistance dog programme is the first of its kind in the UK. However the initial results have been very encouraging. PTSD or post-traumatic stress disorder is the mental illness often linked with military service affecting war veterans who have been scarred in active service. Sometimes these scars are visible, but often they are not. As a result, sufferers can have panic attacks, mood swings, have difficulty sleeping and find some social settings difficult to manage. PTSD can also be connected to traumatic events other than wars and men, women and children can all be affected. The sufferer finds it impossible to return to life as it was before the distressing event. Those with PTSD often become isolated and suffer from anxiety and depression. However the simple act of having a faithful and non-judgemental constant companion, such as a dog, is a huge boost to anyone with invisible injuries. It is a dog’s natural devotion to their owner that makes them perfect for this supportive role. Although not every dog can become a PTSD service dog, trainers look to select dogs for training that show social skills with other dogs and humans, and an ability to anticipate their owner’s needs. A good-natured temperament is also essential. So far the most successful breeds for training have proved to be Labrador Retrievers, Golden Retrievers and some Spaniel breeds. A well-trained PDST dog will protect their owner in all situations and this can foster a greater sense of security to those struggling with mental health. The dogs encourage daily routine such as waking the veteran up and giving medication reminders – they are trained to bring the veterans medication to them in bite proof containers. They are also trained to respond to stress indicators such as crying, stomping, or fidgeting and start to soothe their owner by nestling into them. Furthermore, dogs who have undergone the PALS (Partner Animal Life Skills) Programme are trained to recognise and disrupt common anxieties displayed by sufferers, such as panic attacks or heightened stress arousal where the veteran feels ‘on patrol’ and is unable to relax or function normally in their current surroundings. Veterans may experience certain behaviours prior to and during a traumatic flashback. Their dog is trained to spot these early signs and disrupt the cycle. Having support during these distressing episodes allows the PTSD sufferer to break the cycle and with the help of cognitive behavioural skills, the sufferer becomes better at regaining control of and managing their emotions. PTSD dogs are also trained to respond to nightmares, recognising signs of bad dream distress and waking their owner. Additionally, many veterans report their dog acts as a comforting presence at night and helps them get to sleep. Dogs are also trained to lead their owner to safely in an emergency, such as a fire alarm going off, that a PTSD sufferer may not notice or may not respond to appropriately on account of their distress. Just like a guide dog, an assistance dog for mental health is allowed to accompany their owner on public transport and into shops and restaurants. To become a PTSD dog, training starts as early as 8 weeks old puppies and takes anywhere from 18 months to 2 years to complete. After basic training the dog meets his partner and begins training specific to the veteran’s personal requirements. Having to look after a dog and be responsible for its wellbeing, can also have positive benefits for the veteran’s sense of accomplishment. In return the owner gets the dog’s unconditional support and assistance until their healing process is complete.